External Awnings or Blinds are the most effective form of window covering to reduce heat in the home during summer. Most of the heat generated in a home or office building is due to the sun’s rays hitting the glass. Once the sun hits a glass window and heats it up, there is very little you can do to cool it down. The heat generated here will then enter the home or office building exacerbating the temperature inside. Once this has happened the only way to cool the building down is to use coolers, such as air conditioners, significantly increasing electricity costs. 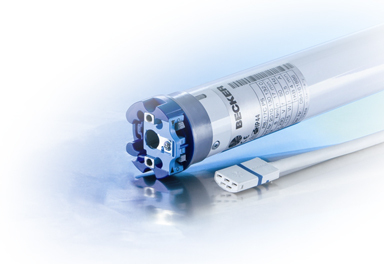 The Mechanical motors are the most basic motors within our range. They offer control of the motor via a hard wired wall switch. These are commonly used on new homes where it is possible to run wires from the motor down to where the switch is to be located. You cannot run more than one motor from a single switch without the use of electronic relays when using a mechanical motor. 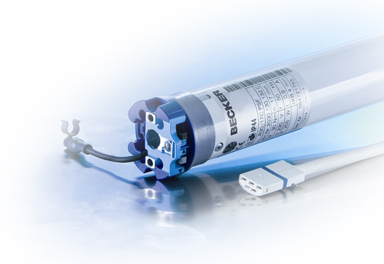 Becker offers Wind Sensors, Sun & Wind Sensors and Timers to operate these motors as your needs arise. They can also be connected to a BMS (Building Management System). The electronic motors are a more advanced hard wired product. They offer automatic cloth length adjustment when the fabric stretches in the awning over time. This will ensure the awning closes completely each time; minimising fabric wear as well reducing the need for service calls to make this adjustment. These motors, due to an inbuilt switching relay, can have multiple motors wired to a single switch.The end limits are simpler to program through either simple switch movement on the motor head or they can be programmed via an installation set. Wind Sensors, Sun & Wind Sensors and Timers can be used with these motors. They can also be connected to a BMS (Building Management System). The radio controlled motors are the most advanced motors in the range. Perfect for the renovation market where wiring to a switch can leave unsightly conduit or damage to walls and ceilings. Only 240v power is required to the point where the blind is mounted, there is no wiring required to the control point. The blind can then be operated by hand held or wall mounted remote controls! Easily programmable intermediate positions are available to the consumer. This allows you, the consumer, to set your own favourite sun position which is remembered each time you would like the blind operated. 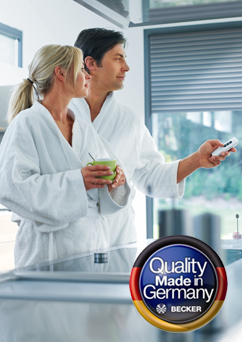 The radio controlled motors also offer automatic cloth length adjustment, minimising fabric wear and service calls. Wind Sensors, Motion Sensors, Sun & Wind Sensors and Timers can be used with these motors. The sensors all communicate wirelessly with the motor, further reducing wiring requirements. 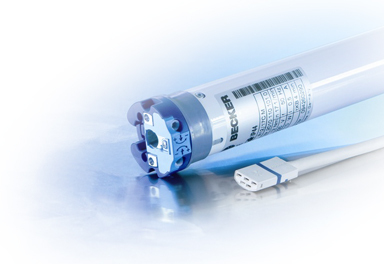 They can also be connected to a BMS (Building Management System), through Becker radio control relays.